The UK’s hottest BBQ and music festival, Grillstock, is back for 2013 with two sizzling festivals coming to Bristol and Manchester, celebrating barbecue culture in all its upbeat forms from southern soul to hillbilly hysteria. The Grillstock Festival will return to Bristol’s harbourside 11th and 12th May as well as making its debut in Manchester’s Albert Square on June 8th and 9th. It’s the destination for anyone that loves real tasty food and great music. At the heart of the festival will be ‘King Of The Grill’, a huge two-day US style ‘low and slow’ BBQ competition with 24 teams battling it out over the smoky coals. 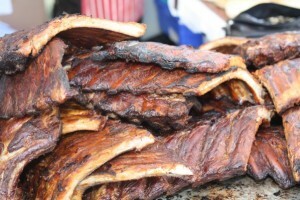 This unique BBQ competition allows visitors to interact with the teams, taste the food and experience their passion and enthusiasm for authentic barbecue. Master of ceremonies is celebrity US pit-master Dr BBQ (aka Ray Lampe), who will oversee the judging for the weekend. This great barbecue celebration will be accompanied by a top class music line up of Americana Roots bands across two stages. If witnessing the smoky, juicy and delightfully meaty King of the Grill competition and the festival’s fantastic soundtrack of Deep South beats isn’t enough, Grillstock also features the now legendary Chilli-Eating Competition as well as the mouth-watering Rib-Eating competition and the informative and entertaining BBQ Academy. Along with the meat, music and mayhem, festival goers can wash the tasty BBQ down at one of the three bars, promising some of the best craft beers from around the UK, aptly named Brewstock. For tickets or to find out how to get your brand involved visit the Grillstock website, follow them on Twitter, or find them on Facebook.